Your heart is your body's pumping machine. It shoots blood to every organ, tissue and cell, delivering oxygen and nutrients to keep them healthy. When you have heart disease, your heart doesn’t pump as well. And that can cause problems for the rest of your body. Heart disease comes in four types. It can be a plumbing, electrical, mechanical or strength problem, or sometimes a combination of the four. Blood vessels can get clogged with plaque, a sticky substance made mostly of fats and calcium. If the vessels suddenly clog completely with a blood clot, you have a heart attack. To reduce your risk, cardiologists like Dr. Kapadia help open the clogged vessels. Often medications to decrease plaque buildup and lower your blood pressure are enough. Other times you may need angioplasty or stenting. That’s when a wire-thin tube is threaded into your clogged vessel. At the tip of the tube is a tiny balloon that inflates to press plaque against the vessel wall, widening the vessel so blood can flow better. 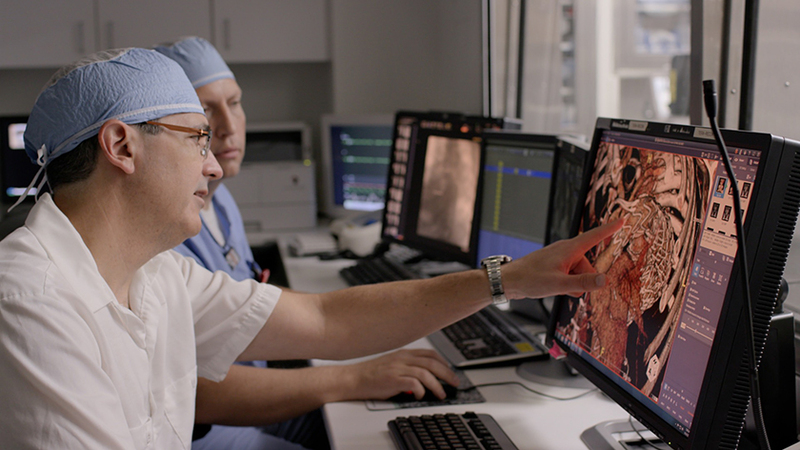 “Usually we leave behind a tiny mesh tube (stent) to keep the vessel open,” says Dr. Kapadia. For tougher clogs, you may need bypass surgery. That’s when a surgeon creates a detour around clogged vessels by repurposing a healthy vessel from another part of your body. The pumping of your heart is controlled by electrical impulses. They pulse in sync, rhythmically moving blood in and out of your heart’s chambers. When impulses are out of sync, your heart may beat too fast or too slow, or quiver. Treatment depends on your condition. To speed up a slow-beating heart, you may need a pacemaker. To regulate a fast-beating or quivering heart, you may need medication or an ablation procedure, which destroys the bits of heart tissue causing the electrical jitters. For severe cases of arrhythmia, a cardiac electrophysiologist can implant a defibrillator in your chest to jolt your rhythm back to normal when needed. Valves control the flow of blood through your heart’s chambers. When valves fail to open adequately or leak, your heart works harder to pump enough blood to your body. Some people are born with valve defects. Others develop them due to infections and other medical conditions, such as rheumatic fever. “Valve problems can cause a host of symptoms, including shortness of breath, chest pain, swelling, fatigue and dizziness,” says Cleveland Clinic valve disease specialist Brian Griffin, MD. Like other mechanical breakdowns, valve disease will only get worse. Minimally invasive “keyhole” surgery, transcatheter valve treatments or robotic surgery is possible for many patients. Your heart can weaken or stiffen over time due to various conditions, such as heart diseases, infections, diabetes and high blood pressure. As your heart becomes less effective and efficient at pumping blood through your body, you may experience a variety of symptoms. Breathlessness, swelling, fatigue and mental slowness all can reduce your quality of life. “The first step is treating the underlying conditions,” says Cleveland Clinic heart failure specialist David O. Taylor, MD. Medications also can help improve heart function by opening blood vessels and reducing blood pressure. “When that’s not enough, some patients are candidates for a heart transplant or an implanted ventricular assist device,” he says. The best way to prevent heart failure and other types of heart disease is by following a good maintenance plan. Eat a healthy diet, exercise, don’t smoke and limit alcohol. See your doctor regularly and take medications as prescribed. Take steps to combat high blood pressure and diabetes. These basics of healthy living will help maintain the plumbing, electrical, mechanical and pumping functions of your heart as long as possible.